The North Dakota Heritage Center & State Museum will open a new temporary exhibit called The Horse in August 2018. Once a topic for a temporary exhibit has been chosen, the curatorial staff examines what we have in the current museum collections and what we may need to fill the gaps. Filling the gaps involves reaching out to the public to find needed objects, not just for the exhibit, but also for the continuity of North Dakota history by adding historically significant objects to the permanent collections. After we have compiled an inventory of artifacts needed, we add those items to our proactive collecting list. Over the past couple months, we have accepted multiple horse-related objects into the museum collections. First, we were offered a western saddle with tooled leather and a saddle pad, which had been used as a training saddle for a young horse named Piper. The saddle has a broken tree and is not fit for riding, so the owner retained the saddle after selling the horse to a family for use in equine therapy. 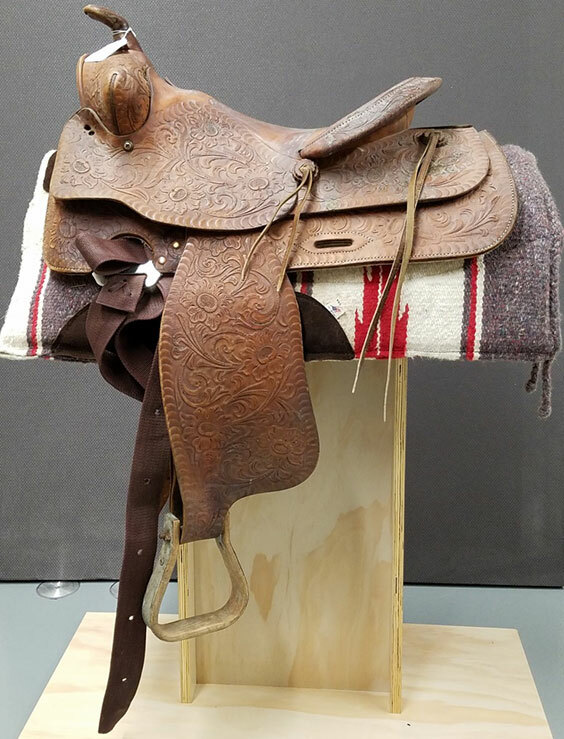 Since the donor’s current horse is much too large for this saddle, she decided to offer the saddle and saddle pad to the State Historical Society. We did not possess any saddles that post-date 1950 in the museum collections, so even though it has a broken tree, we accepted the donation. A toy to entice the imagination of a child is invaluable. We were recently offered, along with other toys and household goods, a stick horse from the 1950s. Once it was determined that we did not have a stick horse already in the museum collections, this was unanimously accepted by the museum collections committee. The stick horse has a red-painted wooden stick and a tan velvet horse head. Veterinary medicine has come a long way over the centuries that people have been taking care of domesticated horses. One of the ways people keep their equines healthy is with medications both prescribed by a veterinarian and those purchased over the counter. The Museum Division was recently offered a box of Zimecterin Gold, an equine deworming paste, along with the administering syringe. The actual deworming paste was discarded because, over many years, the properties of the medication might be detrimental to the syringe and container. Protective horse gear has also evolved over the years. In an attempt to relieve some anxiety and stress from insects, horses may stomp their feet, causing stress on their legs and hooves. They may also rub their faces, body, and tail against posts or corners, causing potential cuts, injury, and tail loss. The increased stress load of pests can quickly compromise the health of the horse. 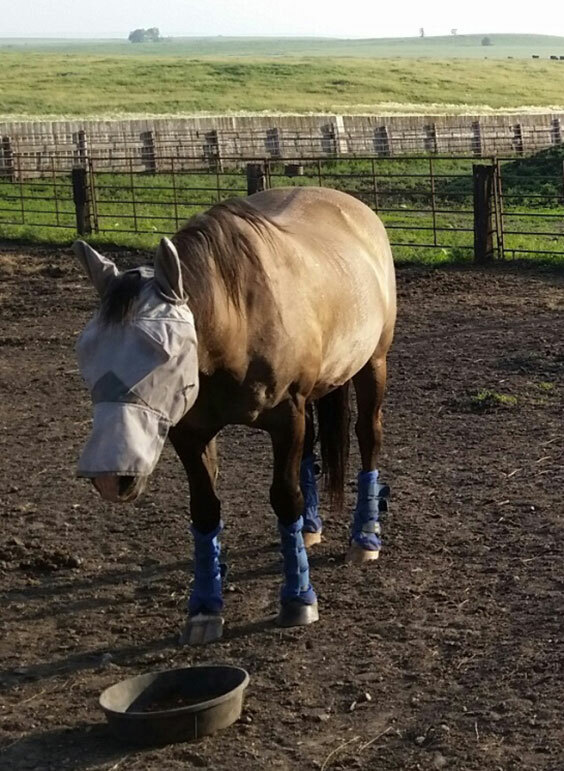 Using a horse mask, flysheet, and fly boots helps alleviate stress from biting, sucking, and irritating insects such as flies, gnats, midges, ticks, mosquitos, as well as protect the face, body, and legs from sun damage. If you have horse-related objects that the State Historical Society should consider adding to the museum collections, such as toys, post-1950 western or English saddles, rodeo equipment, riding clothing (boots, jeans, show shirts, or jodhpurs), bridles, or lariats, please let us know by filling out the donation questionnaire. We look forward to hearing from you.